I found the following two books which fit the bill but if you know of any additional titles, please let me know! Little Rabbit's Loose Tooth , by Lucy Bate looked too cute to pass up. For us, it was the perfect read. For starters, of course, it has an animal as the main character which makes it immediately likable from our perspective. In this story Little Rabbit has a loose tooth and therefore declares that it is impossible to eat carrots and beans because they are too hard. Her parents instruct their young one to use the front loose tooth for softer food items and all the others for chewing the hard things. This she does for a whole week until her tooth finally comes out in a bowl of chocolate ice cream. It is then that Little Rabbit experiences quite the conundrum. What to do with her loose tooth?! She doesn't think she believes in the tooth fairy, in part because she doesn't want the tooth fairy to take her tooth away. Little Rabbit wants to keep her tooth. The question over whether or not the tooth fairy exists is never directly answered in this book and it is even suggested that perhaps Mommy & Daddy could be the ones hiding a gift under Little Rabbit's pillow. This book opened up the question of the Tooth Fairy which we discussed. I explained to Bookworm1 that the Tooth Fairy is a very fun character that is enjoyable to read and talk about. But we made a deal between us. Mommy & Daddy would leave small gifts for the first two teeth that Bookworm1 loses and they would be fun surprises which we would leave for him at night. This has built up some anticipation of losing teeth, which was exactly the point, and it leaves us open to reading fun books about tooth fairies at the same time. Bookworm1 is also an extremely. literal. child. I figured it would be wise to approach the subject from a fact-based perspective and so, with that in mind, we purchased a copy of How Many Teeth? . This book was awesome! It talks about how babies are born without teeth and then they gradually come in. 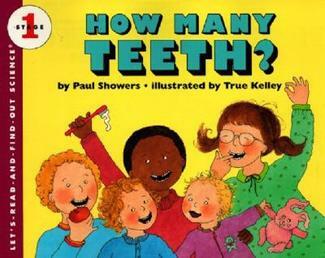 The boys and girls loosing teeth in this book have 20 teeth when their teeth start to become loose. Our dentist made a point of counting out Bookworm1's teeth with him so he was able to identify. Another great aspect of this book are the illustrations which show the baby teeth being pushed to the surface of the gums, making way for the adult - or, permanent - teeth. Seeing this particular page of illustrations was very interesting to Bookworm1 and gave him an idea of what is going on inside of his mouth. He doesn't seem scared at all and knowing some of the facts makes this whole process vastly more interesting to talk about. We are quite pleased with this book. I don't mean to build an entire home library on the topic of loose teeth, but knowing of some other decent titles would be appreciated! If there is one in particular that you have enjoyed with your kids, drop a note! I'll look it up. I am guessing M will be about 7 when she first loses a tooth. She was 13 months when she got her first tooth. I once taught a 3rd grader (petite like M) who had all of her baby teeth at the end of the year. I like the factual book...sounds great! Cute! and yes that would be weird to have it loose so early! I remember having a Little Rabbit story when I was a kid, it was called Little Rabbit's Baby brother and was about how Little Rabbit was afraid her parents wouldn't love her anymore now that they had the baby (which she didn't like for all the screaming!). I have a younger brother... I'm pretty sure I know why we had this book! 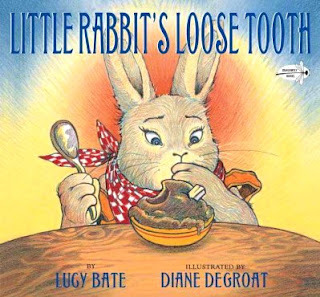 Little Rabbit's Loose Tooth was my absolute favorite book when I was 7 (about 30 years ago). I remember loving the illustrations. I would check it out over and over again from the library. @Yellowinter - VERY glad to have been of such service. Thank you for taking the time to leave a note telling me so. I appreciate your kind words very much.